The Great Narrative in regard to 16th Century Spain is focused on the expansion of Spanish Mercantilism in America and in how the Ottomans were defeated at the naval Battle of Lepanto bringing their dominance of the Mediterranean to a close. Sadly (to a great extent), this Euro-centric perspective started to change and more emphasis was given to the production of knowledge in the Peninsula via the appropriation of the culture and scientific knowledge brought to Europe by the al-Andalus Muslims. The Great Narrative and its “Western exceptionalism” discourse won the battle again and it focused on how “Europe” or the “West” acquired this knowledge and created a “Renaissance of Knowledge” while forgetting the source of it. This Western Renaissance is today widely know and studied as the School of Salamanca. A School that Western historians like to remember as the product in 100% of Catholic Religion, Spanish rationalist theological work, Western humanism and by the Protestant Reformation that was consolidated in Salamanca with the writings of the Scholastics Francisco de Vitoria, Domingo de Soto, Martín de Azpilcueta (or Azpilicueta), Tomás de Mercado, and Francisco Suárez. The “non-western” roots of this Renaissance in the Spanish Peninsula are still not well discussed nor researched. There’s still the need for further study the inherited knowledge from the al-Andalus Muslims (who were later known as Mudéjars) and to establish a direct link of many of the roots of “Europe’s Renaissance” in places as far as the Tigris and Eufrates. Today, my book recommendation will be a great work that exemplifies how this Great Narrative idealized the School of Salamanca as the product of 100% “Western values”. It is worth reading and studying carefully in order to not commit the same mistakes. 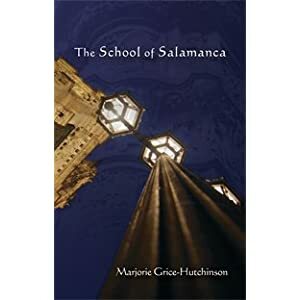 Marjorie Grice-Hutchinson’s remarkable classic, The School of Salamanca, posed an extraordinary challenge when it first appeared in 1952. The book is not only a pioneering presentation of this lost school of monetary theory—fantastic thinkers of Old Spain that were more advanced than the English classicals centuries later–it is also beautifully written. Previous Post New M.A. in History at Universidad Francisco Marroquin, Guatemala.